Senior Arizona Senator and former Republican presidential candidate John McCain ignited a firestorm of criticism over his comments last weekend that the tragic wildfires raging in his state were set by "people who have crossed our border illegally." He immediately called for tighter border security. Although a U.S. Forest Service spokesperson rejected that the cause of the Monument Fire at the Coronado National Memorial was sparked by undocumented immigrants, the Senator didn't back down when Good Morning America's George Stephanopoulos asked him Tuesday one question about the combustible comment. Here is where McCain's facts get mixed up, "The Monument fire was started when the park, when the forest was closed. So anyone in there is illegal." Indeed, the Senator is correct. Anyone in the park after hours is there illegally, an affirmation that the National Park Service website confirms: "The Memorial is open year round from dawn to dusk." However, park rules clearly state that ANYONE in the forest after the sun sets is violating the policy, regardless of immigration status. 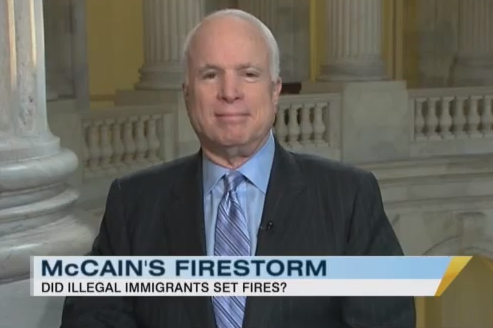 Although it is likely that at least one wildfire in history has been sparked by illegal immigrants who are trying to, in the words of the Senator, "signal others," "keep warm", or "divert law enforcement agents, agencies", McCain omitted other common culprits such as arsonists or campers who fail to fully snuff out a camp fire. Unfortunately, George did not press McCain on his answer because the GMA anchor moved to news of the day--troop withdrawals from Afghanistan. The blogosphere and social media, though, are inflamed and accusing the Senator of dragging immigration reform into the devastating Monument Fire, dousing this debate with gasoline, then throwing in a lit match. McCain is a war hero who has a track record of honorable service that spans decades in the Navy and in the U.S. Senate. This includes co-sponsoring with the late Senator Ted Kennedy the imperfect Comprehensive Immigration Reform Act of 2005 which failed, in part because critics argued it granted illegal immigrants amnesty. Without conclusive evidence that undocumented workers sparked the Monument Fire, the Senator needs to immediately apologize for diverting attention from this devastating event. As important, he should return to his independent streak and earlier tendency to reach across the political aisle to fix our broken immigration system with sensible reform which ultimately will dampen the fiery tenor of anti-immigrants, strengthen the U.S. economy in part by forcing companies to pay payroll taxes, and unify divided families.